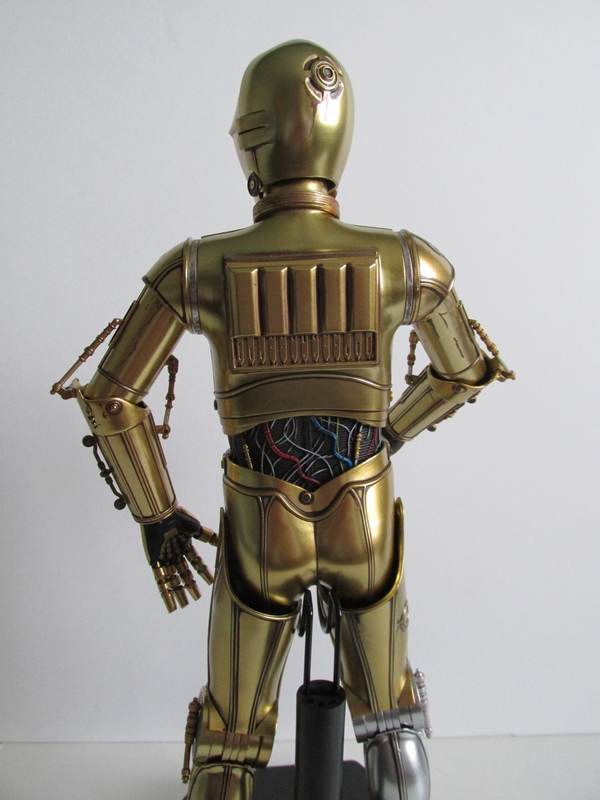 Sideshow Collectibles has finally released their version of C-3PO in the sixth scale format. 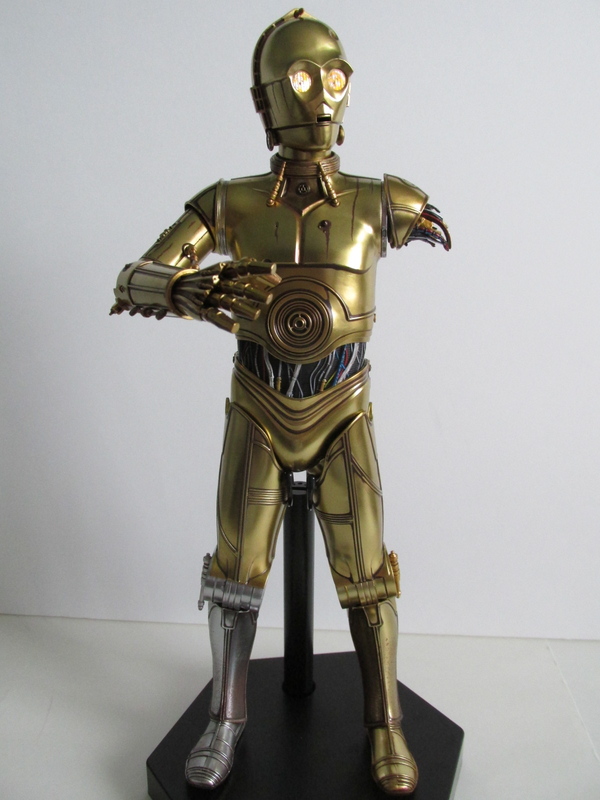 Like their previous release with R2-D2, this version of C-3PO seems to represent the look all of the original trilogies and not truly tied to just one movie. 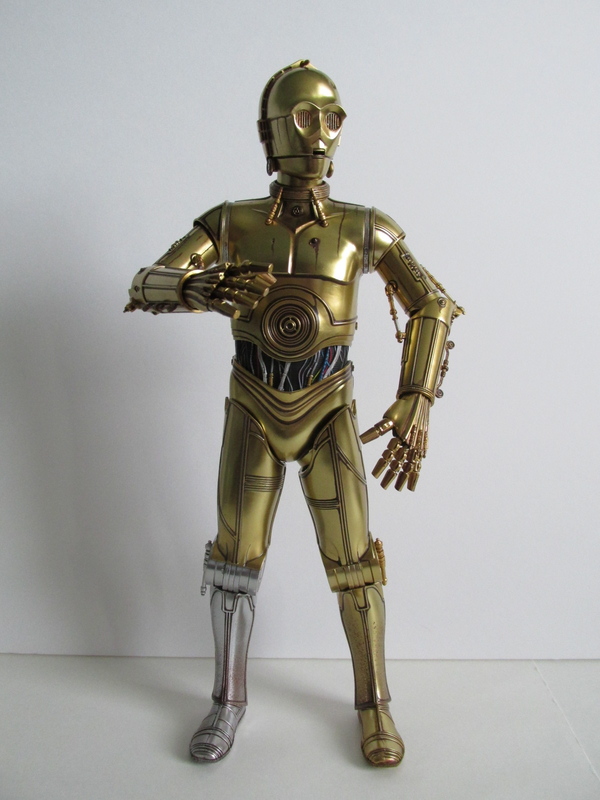 C-3PO is made entirely of plastic and also has a great light up feature. This is the Sideshow Exclusive and comes with a broken left arm stub. This is a great sculpt and design of C-3PO and is a satisfactory figure. His paint details are great, and Sideshow did a great job with created the rusted and oxidized look on the figure. On some level you could easily fool people who aren't familiar with this release into thinking this is all die cast metal just from the paint detail performed on this figure. The one part he fails on is articulation. 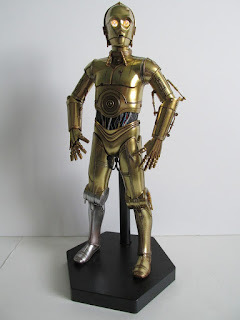 This character was never known to fully bend his joints or even run so it makes sense his articulation is very limited. While he can move his arms in a full circle, his elbows have a tough time bending and his legs cannot truly move. Again the design elements of the original costume hinder movement, and Sideshow was only going with keeping it as accurate as possible. My only gripe with this is how fragile it feels when moving his arms, which are connected by rods on his bicep and forearm. He comes with a base, cradle with rod, two restraining bolts, intercom microphone, and the Sideshow Exclusive broken arm stub...that's it. The base is a cheaply put together octagon base and has no design on it all...except under the base it reads, "Star Wars" in big gray letters. I'm not sure if he wore two restraining bolts but it seems only one can go on the right side of his chest since there's some other gear on the left side. The bolts are magnetic and easily fit on the chest. His intercom microphone is a great prop, but his hands are so clumsy that it is hard to make him grasp this prop. His broken arm stub can only go on the left arm and extra care needs to be taken when removing the arm out since its quite possible to rip the socket that connects the arm to the body. Sadly, he cannot hold his other arm, since his fingers are just not made to do that. On the plus side, his light up eyes are great and easily turned on. Sideshow seems to excel at these features and couldn't be more pleased at the ease of this function. All you do is remove the tab from the neck and then simply tap the button/socket on the back of his head. 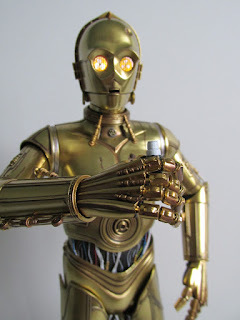 I'm loving that I don't have to do any extensive procedures to get the electronic functions running like with Darth Vader or Iron Man figures, and hopefully Hot Toys can take a page from Sideshow's book on this kind of functionality. 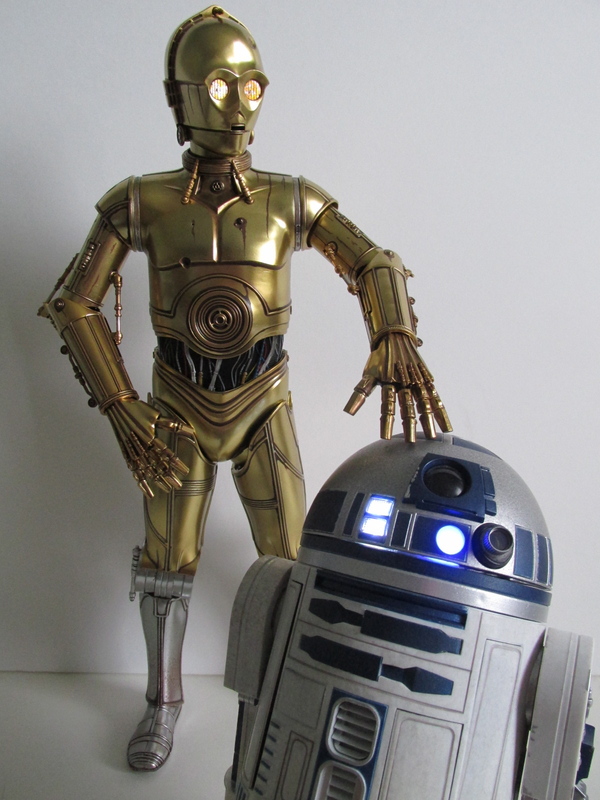 Overall, I'm pleased with this figure, and he looks great with Sideshow's R2-D2. 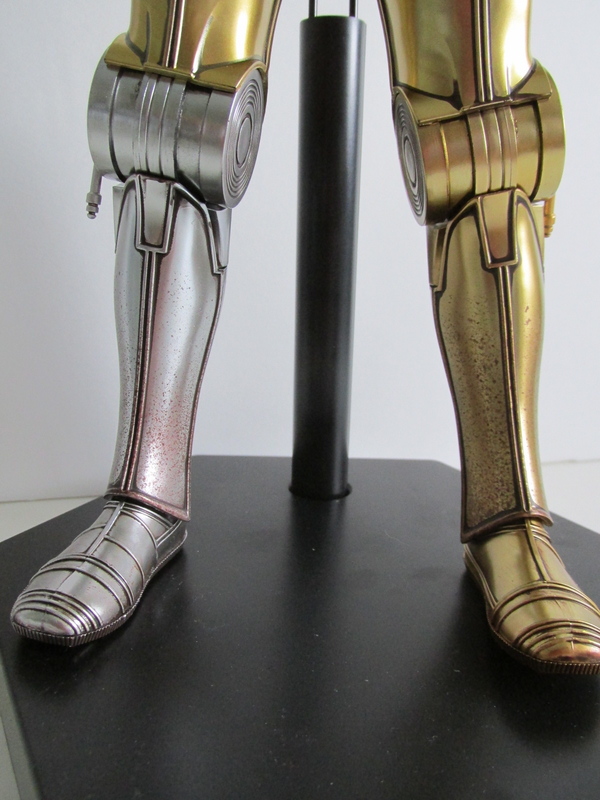 The exclusive version is sold out so if you are itching to get this figure you'll have to go with the regular version, which I think will be just fine unless you intend to display the figure with the broken arm.